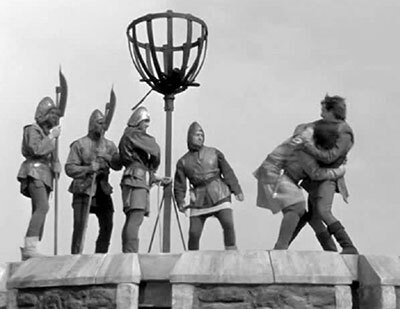 One of the most famous – and remembered stunts in 50s film history is this 100 ft dive from the top of Torquilstone Castle in Ivanhoe 1952. Although there are a lot of stunts in this film, there is one that stands out and that is Paddy Ryan’s fall. This was reported to be the highest fall at that time in films. 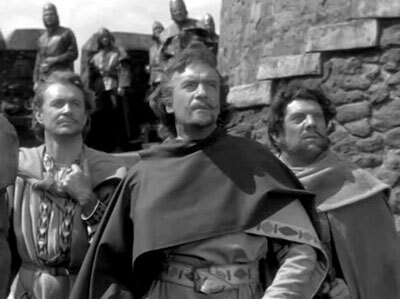 In the film Ivanhoe openly rides to Torquilstone castle to give himself up to the Normans if they will release his father and other hostages. Stuntman Paddy Ryan’s fall from the battlements of a castle into the moat below, became the stuff of legend amongst his stuntmen peers because it was so spectacular. 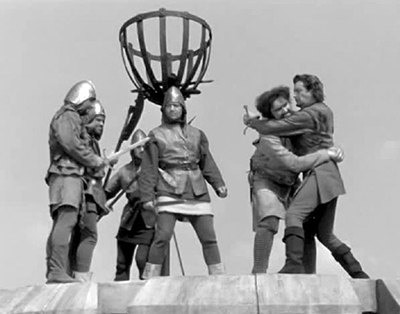 Torqilstone Castle was built for the film in the grounds of the MGM Studios at Boreham Wood in Hertfordhsire – and in fact was kept there for and used in later films of the mid Fifties. Somewhere in my collection of Film Books / Annuals of the time, I have another – and better picture of this fall, so will try to look that up for a later article on this site – and we will also come back to Torqilsone Castle.